November 1997 The I.K. Gujral-led UF government falls after Congress withdraws support when its demand for sacking DMK ministers is rejected. The demand came after a Jain Commission report on the assassination of former prime minister Rajiv Gandhi had held that the DMK had tacitly supported the LTTE. 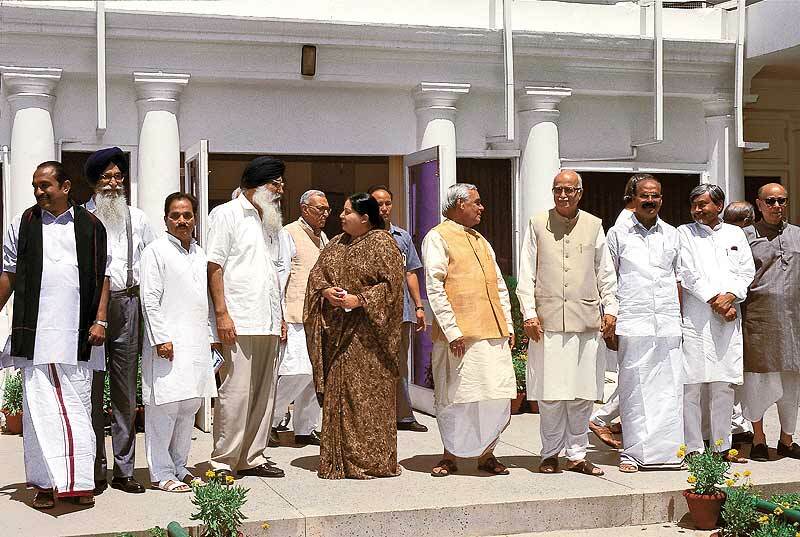 April 1999 The Vajpayee government collapses after AIADMK leader J. Jayalalitha withdraws her party’s support to the BJP-led coalition government. This followed months of serious differences between the BJP and its ally AIADMK over distribution of coveted portfolios and her demand for the dismissal of the DMK government in TN. December 2003 DMK withdraws itself from the ruling NDA coalition, months before the Lok Sabha elections in 2004. Ties up with the Congress-led UPA, attributes its decision to criticism by then BJP president Venkaiah Naidu about a DMK protest against the Centre’s stand on POTA. July 2006 The DMK threatens to pull out of the UPA government if any stake in the Tamil Nadu-based mining company Neyveli Lignite Corporation is divested. The plan is abandoned later. October 2008 The DMK threatens to withdraw support to the Centre if it does not push for a ceasefire between Sri Lanka’s armed forces and the LTTE. Backtracks later. May 2009 The distribution of berths after the victory in the general elections proves divisive. The DMK threatens to not continue as a member of the coalition. The Congress give in to some of its demands. 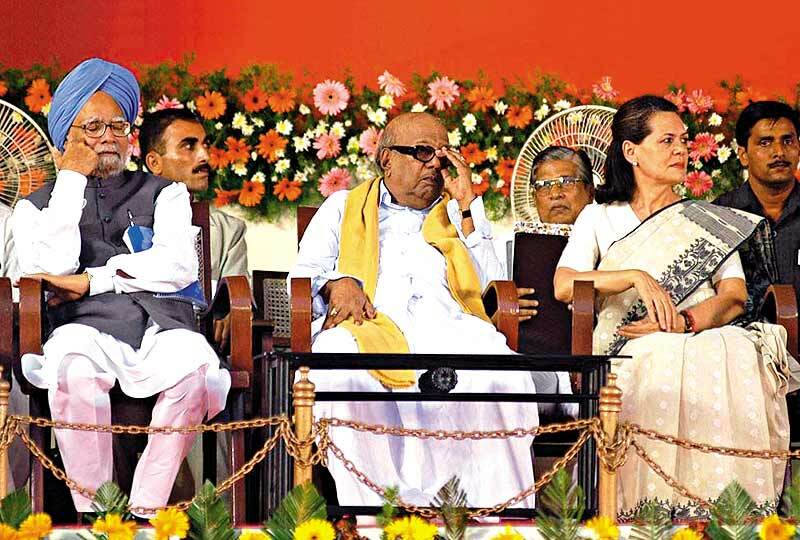 March 2011 The DMK withdraws support to the UPA after differences emerge on seat-sharing in the TN assembly elections. Later, the party finally dives in to the Congress demand. May 2012: Demands a rollback of a hike in petrol prices. In between, the party threatens to withdraw support yet again but fails to act on it. Atal Behari Vajpayee would always tell people that the several days’ wait for a letter of support from AIADMK leader J. Jayalalitha was a nightmarish beginning to his six years as PM. Those who covered that era have vivid memories of the lady driving into 6, Safdarjung Road (occupied by Vajpayee before he moved to Race Course Road). As the vehicle stopped under the portico, a man would charge out with a foot-stool. It would be placed for the lady in the cape to step on before she walked on flat earth and accepted the ground beneath her feet. The NDA managers were both fascinated and tormented by her. A year later, she dumped them after her frequent dem­ands that the Vajpayee regime dismiss the Karunanidhi gov­­ernment in Tamil Nadu were parried off. The NDA government then collapsed in Parliament one vote short and fresh elections took place, after which the DMK became part of the NDA—easier to manage on the surface but with a foc­­u­­ssed approach to extracting the maximum possible from the alliance. Muthuvel Karunanidhi was pampered, consu­lted, plied with several sha­wls and angavastrams. He stayed the course much longer, but by December 2003, he too was done with the NDA. Just about a decade after he told the BJP to take a hike, it is the same Karunanidhi, now 89, who has delivered the big­g­est jolt to an increasingly vulnerable Congress. This time he’s also seen a political opportunity to try and regain some credibility on the Sri Lankan issue and get rid of an ally who currently appears to be baggage rather than an asset. Dit­ched and angry, it can only be a matter of speculation on whether the Congress really did order the subsequent CBI raid on the residence of Karunanidhi’s son M.K. Stalin, and question grandson Udayanidhi about the purchase of an imported Rs 1.4 crore Hummer in 2007 (see box, page 36). Still, there is little doubt that after the next general elect­ions (early or on schedule), the national parties will again queue up outside the doors of whosover carries Tamil Nadu. And if we go by recent history, then let’s also be aware of the fact that although the Hindi heartland players are important for their numbers, it’s the Tamil politicians who have been the regime topplers. Politicians and political parties from the state have embraced the Centre only to rudely ditch it time and again. They have proved the hardest bargainers in the game-of-reg­ional-extraction-from-the-Centre, the most callous in their exits. Yet, they will always be courted by national parties. The “Tamil Gaze” on New Delhi is quite particular and dis­­t­inct. All those secular, non-secular arguments that are used to keep other parties in line do not apply to the Tamil forces because politics is defined very differently in the state. Their ideologies were once rooted in the Dravida consciousness, anti-Hindi and anti-Brahmin movements, but now it’s the routine development and livelihood issues along with a certain arithmetic of alliances with caste/ide­n­tity-based smaller parties that determines politics within the state boundaries. Dr V. Suresh of PUCL says the parties in the state have no national ambition because the definition of their politics is regional. “Unlike a Mayawati, whose caste-based politics strikes a chord in other states barring Tamil Nadu, the politics of Tamil Nadu is circumscribed by geography and language. Even the full form of DMK or AIADMK are distinct Tamil names. That’s why perhaps the Aam Aadmi Party with a distinctive Hindi name will have few takers here and even the CPI, CPI(M) and Congress cannot be big players,” he says. From the war-cry of ‘Hindi Ozhiga’ (Banish Hindi) on the Marina beach in the late ’60s when it was sought to be imp­­osed by the Centre, to the Cauvery/Mullaperiyar issues, and the more recent student protests over Sri Lanka’s war crimes, the state continues to be obsessed with its own inner workings and distinct contemporary issues. Of this, the most dramatic and complex is the Sri Lankan one, a culmination of which was the most brutal political assassination in contemporary Indian history. It’s also worth recalling that the same Congress that has now been so stunned by Karunanidhi’s departure, once pulled out support to the I.K. Gujral government in November 1997 after its demand for sacking the DMK ministers was rejected. (It came after the Jain Commission report on the assassination of ex-PM Rajiv Gandhi held that the DMK had tacitly supported the LTTE, which was responsible for it). At times, it seems the blood trail from the terrible events in Sri Lanka are conveniently forgotten. In the routine ban­­alities of Tamil politics, it has at times certainly appeared to be grand farce. But blood trails have a way of reappearing and being remembered in people’s collective memories. In the present case, the war atrocities by the Sri Lankan army have been bro­ught to life by still and moving images, creating a spontaneous students pro­test in the state. Indeed, there is even talk that the ferment on the street is what sparked off this pullout. The Students Federation for Free Tamil Eelam has been among those spe­e­rheading the effort to make it a state-wide movement. As member and Chennai Loyola College student Sembiyan says, “We maybe two nations, but the Tamils on both sides are the same. How can we keep numb in the face of such a genocide?” The college, along with others, has been shut to prevent org­anised protests. “This is not going to suppress the uprising. The state governments do nothing. It was the DMK in the state when the 5th Eelam war took place and Prabhakaran was killed. They did nothing then but shed some crocodile tears. They are repeating the same now just to get some political mileage,” says Annie Abhinaya, a law student and active par­t­icipant in the protests in Madurai. Ask eminent sociologist M.S.S. Pandian about his state’s politicians, and he retorts that the real story is happening on the streets, where the students have been out for weeks. “And yet the media in Delhi is focusing on the political parties and the future of the UPA,” he says. True, it is one story from Tamil Nadu that is yet to get much play in Delhi. Perhaps it may be considered of greater significance if it is understood in the context that Karunanidhi acted the way he did because he suddenly saw a huge energy in the streets and possibly thought this was a way to link himself with a sentiment and rage which was out there. For all the corruption scandals, contradictions and dynastic rule now linked to his name, it cannot be said that the octogenarian does not have the pulse of the people. Karunanidhi did, after all, cut his teeth on what was once a great movement. No party, however ready, is jumping the gun. Impending assembly elections are the key to any ‘early’ decision. The weapon of CBI at work again? The Sri Lankan high commissioner on the agitation in Tamil Nadu and the future of Indo-Lankan relations.